Double-sided Transter-Tape. 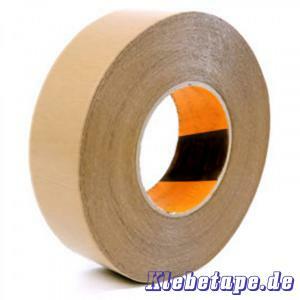 Is used as assembly tape for the fitting of carpet sklrtings. It can be used on nearly every surface like wood, metal, plastic, concrete, e. g.
Our E65 double sided Transter-Tape has a very aggressiv glue. It has a very high initial tack. It has a very good plasticiser and ageing resistance and is free of solvents, Chloride and formaldehyde. Typical it is used as assembly tape for the fitting of carpet sklrtings. It can be used on nearly every surface like wood, metal, plastic, concrete, e. g.
Before applying the skirting to the wall the protective paper has to be removed and then the skirting is to be pressed strongly against the wall.